Over 720,000 EU citizens have moved to Germany every year since 2011, totaling over 5.1 million. 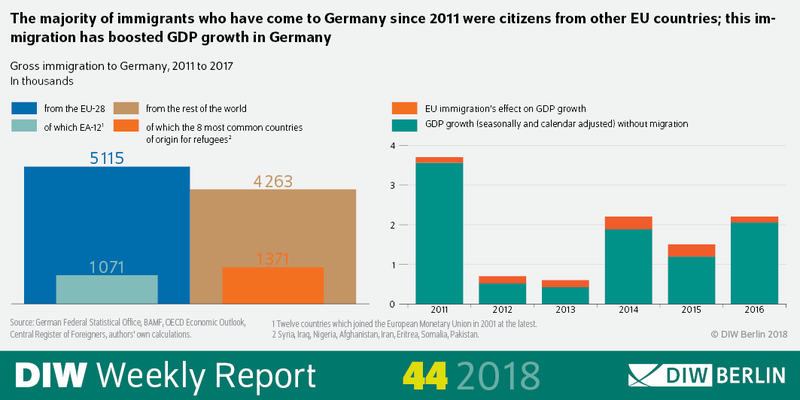 More Europeans have moved to Germany than have individuals from other countries, including the main countries of origin for refugees—even though the issue of refugees has dominated public debate in recent years. The figures are from the Federal Statistical Office as well as Eurostat and are somewhat more reliable for use in economic analyses than net migration figures. Net migration is only partially recorded because not everyone deregisters upon leaving Germany. The introduction of free movement for workers for citizens of EU countries in 2011 (for all EU member states which joined in 2004), in 2014 for Romania and Bulgaria, and in 2015 for Croatia, led to an increase in EU immigration. The severe economic crisis in a few southern European countries (Spain, Italy, Greece) also led to an increase in immigration to Germany. In addition to these explanations, DIW Berlin used a macroeconomic model to quantify the significance of various factors for immigration to Germany: the economy and the labor market situation in Germany compared to other EU countries play a role here, as do “migration costs.” Migration costs include actual moving costs (including visa fees and bureaucratic fees) as well as the combined monetary value of all factors, whether they be legal or psychological, that make immigration difficult. Legal barriers are important here, but they are not the only influencing factor. There are other barriers, such as a lack of direct flight connections between two countries. The calculations show that a deteriorating overall economic situation in the country of origin compared to Germany is the main driver for immigration—it explains about 60 percent of the changes in EU immigration. Labor market developments account for around one quarter of immigration from the rest of the EU. Moreover, the development of migration costs explains a noticeable share of 16 percent of EU immigration. Most EU immigrants are young, highly qualified, and have a high labor force participation rate. In 2017, the employment rate of EU citizens was 74.6 percent, compared to only 70.6 percent for Germans. This requires, among other things, simplifying the procedures for recognizing foreign qualifications. However, this applies to immigrants from everywhere in the world, not just the EU, according to Clemens and Hart. The planned immigration law recently presented by the Federal Ministry of the Interior is certainly a step in the right direction, but further efforts are necessary. These efforts must also work towards the goal of improving Germany's “welcoming culture,” a general positive attitude towards foreigners and migrants.